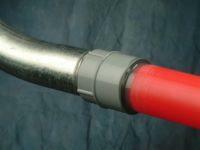 Versatile – Bonds HDPE to PVC, rigid steel, and fiberglass conduits and fittings. Superior – Stronger pullout strength than mechanical couplings. Durable – Bonds with high strength within an hour. Easy To Use – Requires no special training. Convenient Kits – Contains all application components required for a quick installation. 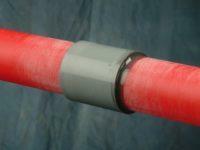 BonDuit® Conduit Adhesive bonds create watertight and airtight conduit connections within an hour after application. The strong bonds withstand movement and vibration, making them ideal for installation along roadsides or near electrical equipment such as transformers or switchgear. BonDuit® Adhesive is easy to use and cost effective. It requires no special training and minimal labor to apply. Total application time is typically less than five minutes. Field application tip: Long-barreled couplers can double pull-out strength! Deeper coupler inserts provide more surface contact area for BonDuit® Adhesive to works its magic. It adds strength for just pennies more. Polywater® BonDuit® Conduit Adhesive is a two-part curing adhesive supplied in a side-by-side cartridge. BonDuit® requires a ratcheted dispensing tool and nozzle to mix and apply quickly and easily. 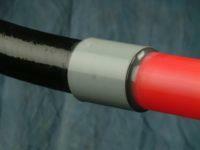 Several splices can be made from a cartridge (see application instructions). The cartridge can be recapped for later use with a new nozzle. Cold Weather Information: Keep BonDuit® Adhesive warm for optimal performance. Warm BonDuit® Adhesive will cure and produce functional seals in ambient temperatures as low as 40° F (4° C). Below 60° F (16° C) the unmixed BonDuit® Adhesive components thicken and become difficult to dispense from the cartridge. Keep BonDuit® Adhesive indoors or in the warmest part of a service truck until use.